In this era of accelerating change, overwhelming complexities and tremendous competition,one often finds it hard to keep going. There is always a battle going on within, which commences from morning, to the time one goes to sleep. When the morning alarm clock rings,the aching muscles of the body plead in an unanimous voice, saying that it is too dark,too early to get up, and asks to go back to the dreamland,pretending not to hear the the command of the brain,which says that there was a reason you set the alarm at the first place. Even in school, one feels intimidated seeing the efforts one has to put in to get to the top,and more importantly,to remain there, since in academics, it doesn't take time to plunge from sky high to rock-bottom. When one is going through a rough patch, when difficulties and obstacles seem to be ubiquitous,the only reliable partner is perseverance. It is a guiding light which helps a person to get from where he is, to where he wants to be. Faith, passion, efforts and sweat are it's ingredients, success is the product. 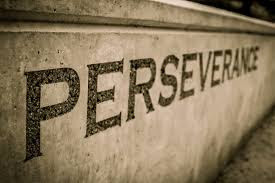 Perseverance is a tool which stimulates the fear of mediocrity and the hunger for excellence. In life,we should acknowledge the fact that it would be insane to expect someone to hand our dream in a golden plate, saying 'here's your dream manifested'. One has to strive,hustle and fight one's way through the hurdles of life in order to emerge as victorious,and that's exactly perseverance is all about. Let me end by quoting Robin Sharma,"Starting strong is good,finishing strong is EPIC".